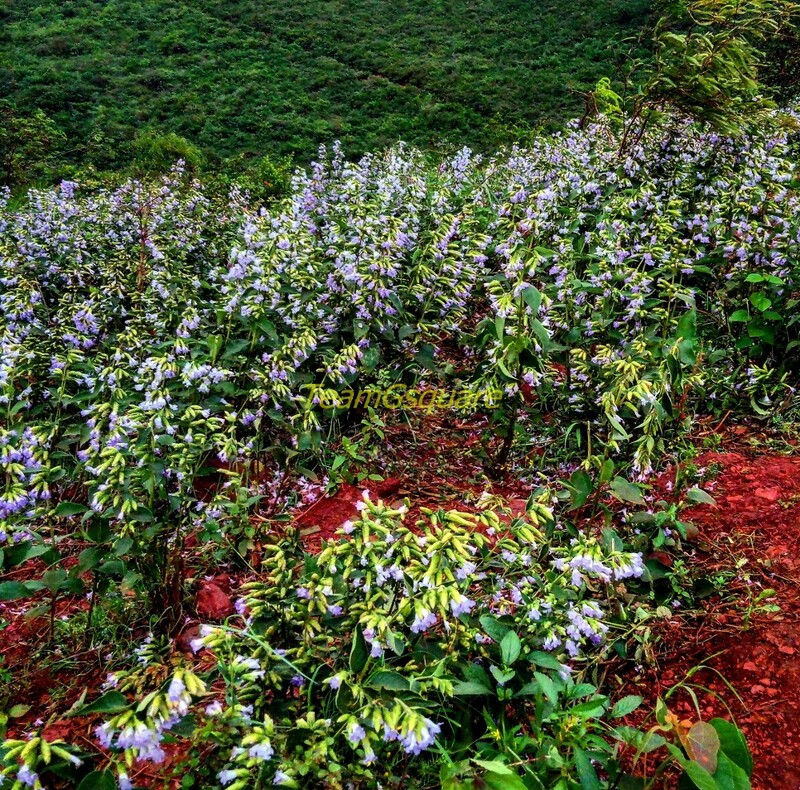 An article published in Bangalore Mirror on the 12th of September, 2017 about the rare phenomenon of 'Neelakurinji Flower Blooming' in the Swamimalai hill range of Sandur, followed by subsequent photographs of the same on twitter by a few friends instigated me to visit Sandur and witness this phenomenon. This rarity is an indication that the hills of Sandur should be left on its own and nature will find its own way to recover. It is also high time that Sandur follows the footsteps of Kudremukha by the way of completely banning mining practices to restore its natural wealth. 'Strobilanthes kunthianus' or 'Neelakurinji' as it is commonly known, blooms once in 12 years in some parts of the western and eastern ghats. It is a shrub belonging to the family of Acanthaceae (dicotyledonous flowering plants) and is monocarpic, producing flowers and fruit only once before dying. They are Plietesials exhibiting mass flowering and mast seeding once in 12 years. The color of its flowers vary in shades of purple. There are more than 40 species of 'Strobilanthes' in India with different life cylce lengths. Their blooming at long intervals is attributed to a survival strategy they practice known as 'predator satiation', which basically reduces the probability of complete destruction of the species. This behavior has also been observed in bamboos, cicadas and a few other species. After a tiring night journey, we reached the site of Kurinji flowers on Sunday morning around 11:00 am. The bloom was present in a few parts covering small areas. There were many people thronging to get a glimpse of this rare occurrence. Seeing their behavior, I felt the concerned authorities must have taken a step or two to protect this precious site by restraining people form moving into the Kurinji shrubs and behaving irresponsibly being unaware of its rarity and biodiversity value. At least, a board stating 'touching and plucking of flowers is prohibited' would be helpful (only if followed though) !. A kind request from our side to all wanting to visit here or any other site of importance is to 'Please be sensitive and responsible, and enjoy without causing any kind of damage or destruction to our natural wealth'. Also remember not to litter. Thank You. The bloom this season at Sandur hills may last another 10-15 days. "We Save Nature and Nature Will Save Us"
I am planning to visit this weekend. Can I catch a glimpse or will the flowers wilt away by that time? Hopefully it should last for another 10-15 days. Very nice. Do you know how long it lasts? Interesting to learn about these beautiful blooms! Pretty flowers. The earth looks like red earth. Lovely. Truck in picture shows these flower wont be there in 2029. You were witness to one of the most amazing occurrences in nature. But man is greedy and hell bent to destroy the environment. Hope good Samaritans like you will gather force and start a movement for the preservation of Sandur hills.